Zoo Med's new Can O' products are the latest in reptile nutrition and convenience. Our full line of feeder insects are cooked in the can (called retorting) which locks in the flavor and freshness while also softening the exoskeleton for easier digestion.Large size grasshoppers. Ideal for large monitors tegus skinks turtles and birds. 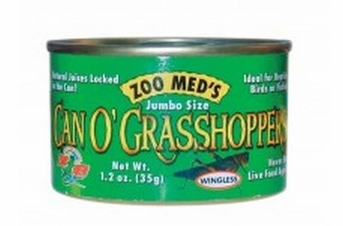 Extra large grasshoppers 20 per can.